Last week we did things a little differently by putting the gears inside the comments below to make it easier for you to comment on individual gears. I think there were some benefits to it, but let's try it out the other way. I still encourage you to make your own gears in the comments that we can heart-click to the top. Once there was a time when Ford used social media influencers to launch the tiny little Fiesta in the U.S. Was it a success? They still make the car, so perhaps. We were certainly bombarded with videos and stolen cars and the like. Ford must have liked the idea because they're doing it again, this time with the aim to promote content built by "influencers" on television and in "a popular magazine." Get ready to be overwhelmed by hashtags until you want to make a movement in your pants. 2nd Gear: What Does A Bentley Smell Like? French fragrance maker Lalique has teamed up with quasi-British carmaker Bentley to offer a line of "bespoke" scents just for men. What does a Bentley smell like? The perfumer behind the scent says she "[C]hose cedar because of its powerful unadulterated scent and patchouli for its sensual depth and natural elegance." We're big fans of the new line of Bentleys, particularly the Continental GT V8, but we'd appreciate it if you'd run over us with an adequately-powered vehicle if we ever wore anything with a sensual patchouli scent. You know what a Bentley should smell like? Motor oil, good scotch, and power. It's a Bentley, not a prissy Rolls Royce. 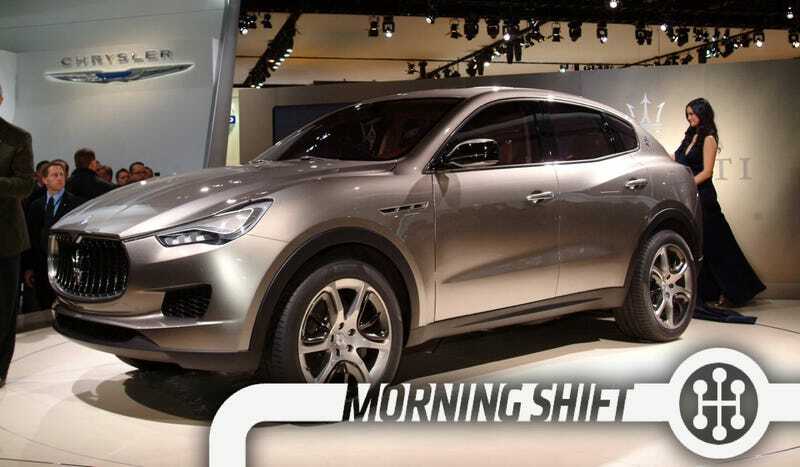 Much as we loved the idea of the Maserati Levante ne Kubang being built at the Jefferson North Assembly in Michigan, The Detroit News reports that the Grand Cherokee-based SUV will actually be assembled at one of Fiat's massively underused plants in Turin, Italy. Chrysler would like to assure everyone this has nothing to do with lunch break habits of workers at the plant, but rather because, you know, they're too busy at Jefferson North building other things. That's a nice spin, but we think the need to use all of that manufacturing capacity in Italy probably plays more into this decision. The Italians already seem to think Fiat-Chrysler CEO Sergio Marchionne is neglecting the motherland for America, so it only makes sense to bring some jobs home. Temporary GM CEO and permanent font of self-congratulations Ed Whitacre is still at it, telling The Free Press that he thinks it was right for GM to keep its money-losing Opel arm saying "I think it can be fixed. It's management. That takes a while. But I think the know-how to fix things in Europe is here." It's not just that Opel is losing money after years of questionable oversight, there are significant structural economic issues within Europe that make it very hard for the company to be profitable in the near-term. The jury is still out on whether or not Girsky is making the grade. But am I being too hard on Whitacre? Akerson's turn as CEO hasn't been awful, the product coming out of GM has been better, and there's no sign that Fritz Henderson would have had much success. Bias check me below. 5th Gear: The Greatest Heist Ever? Per Gawker, eight armed men cut through a security fence at the Brussels International Airport, drove cars onto the tarmac, and robbed a Swiss-bound plane of millions of dollars worth of diamonds without firing a shot. The heist pulled in nearly $50 million in diamonds and the thieves, so far, have gotten away. The whole thing took about three minutes. Where were the police all this time? Good question.